Today I had a little victory over stupidity of default options of the one very big software company. I was relatively happy with IE4 and it is still my favorite browser, however reality is pushing to use IE5 more and more. IE5 is not that bad, has many new nice features and overall seems to be better (let's forget, that I personally think, that it's not that stable yet). Obviously there are problems, mostly caused by including too much extra crap, that no experienced user would want, moving menus around etc. However, above all those imperfections, there was one, that was annoying me the most and simply was reducing my productivity. You know how in IE4 and Netscape 4 they have AutoComplete in address bar - you start typing and it suggests you a possible completion and usually it would take me to type two-three letters, and simply hit enter. Very quick, very useful, everyone seems to like it. Even Microsoft was advertising it, when IE4 was about to be released. NO, in IE5 it's gone by default. You can't even imaging, how much it was driving me mad. So finally, today I found the way how to fix it, so it works the right way. Tada: There are two checkboxes that control it. One of them in the obvious place: Tools » Internet Options » Advanced » Browsing » Use inline AutoComplete for Web addresses and this one must be checked. The second one is more tricky, even though it sounds almost the same: Tools » Internet Options » Content » Personal Information » AutoComplete » Use AutoComplete for Web addresses and this one must be cleared. Notice how those morons try to hide it. Also, speaking about browsers, Netscape released new version - 4.7 (Linux and Mac ones were released few days ago, but windows one just today I guess, it's good, because users of the minority OSs did not feel left behind by a minority browser) Netscape is trying to catch up after IE5 and introduces some nice "new" features like radio and built in winamp. 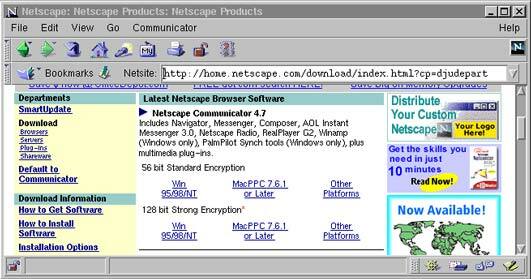 I still hope that upcoming version 5 will be able to stop decline of Netscape and will be a much better browser as well. I kinda angry that Netscape does not release new versions of Navigator. Communicator is heavy and similar to the their big competitor includes ton of crap. In addition to all there is a final decision about merger between Fleet Bank (Fleet + Shawmut + º) and BankBoston (BayBank + Bank of Boston +º) Somehow I suspect that they do it just to be able to rip off customers that were left with a little choice. All these recent mergers smell bad and they are happening left and right last two years.